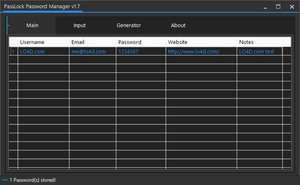 PassLock Password Locker is a small and compact password manager built for modern versions of Windows. Upon first running PassLock, you will be required to create an account. To create a database, the username field should already be filled in with your Windows username. You should then enter a password, secret question and a secret answer. For security reasons, you should also check out the PassLock Password Manager download at LO4D.com which includes virus and malware tests. Additional screenshots of this application download may be available, too.